You are a rain cloud, and your most important job is to shower your Lil' Sprout with love. This tee depicts a fun and simple illustration of the relationship between you and your baby. 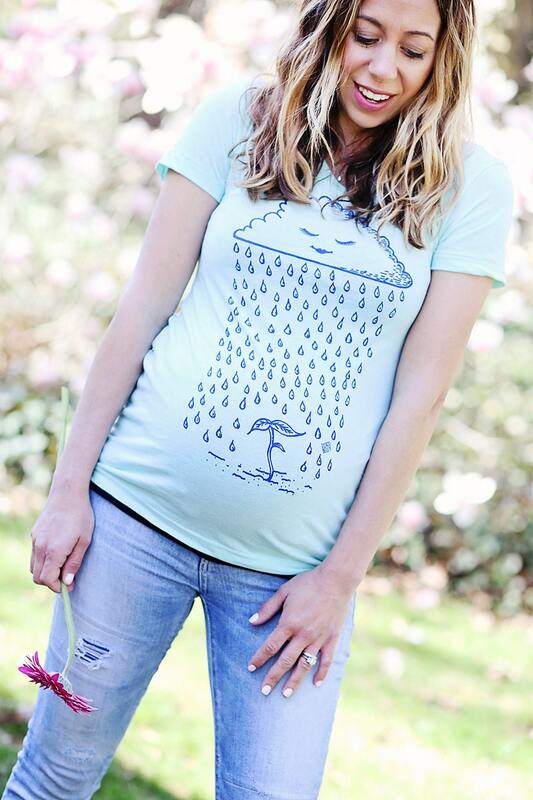 Original artwork, the first rain cloud maternity tee to hit the market! Printed in royal blue on a super-soft, mint green discobelly maternity tee. Handmade (with love) and custom cut and sewn in USA. If you're on the fence, we suggest ordering one size up. If you don't mind this being a regular shirt, go for it because the color and design is super cute! However, I ended up returning it. It's just a regular tee and not a maternity shirt, so I was in between sizes without the option of it growing with my belly in the future. Wish it had the ruched sides. The seller did provide me with a full refund, which I was very thankful for, but communication was very spotty throughout the process. This shirt is adorable, I love it! Thank you!